Pure Wool DK in 007, Cedar. 1 x pair 4mm needles. 1 x pair 5mm needles. Using 4mm needles, CO 104 sts. Row 1: *K2, P2. Rpt from * to end. Repeat row 1 until work measures 4cm, ending with a WS row. Next row: (change to 5mm needles) K1, *YO, K2tog. Rpt from * until last stitch. K1. Repeat last row until work measures 18cm from cast on edge, ending with a WS row. Decrease row 7: K1, K2tog to last stitch, K1. Decrease row 9: K2tog to end. Decrease row 11: K2tog to end. leave it to dry. This should open out the lace pattern. We finished our beret off with a row of double crochet in a contrasting colour around the brim, and some simple fabric and button flowers. To honour my first love, tea and cake, and following a long hunt for tptc (the perfect tea cosy), I have come up with this little number which is, I hope, not far off. 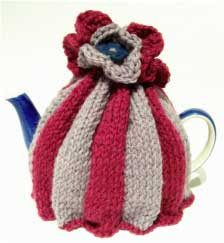 The pattern will fit a medium (large) traditional style teapot. 2 x 100gram balls Rowan Pure Wool Aran (or similar). We used Raspberry & Pepper. Using 5mm needles, CO 56 (72) sts using MC. Row 1 – K8 in MC, join CC, *K8 CC, K8 MC. Repeat from * to end. Row 2 – *P8 MC, P8 CC, repeat from * to end. Row 3 – *K8 MC, P8 CC, repeat from * to end. Repeat rows 2 & 3 until piece measures 11(15)cm from cast on edge, ending on a WS row. Next Row (decrease row) - *(K6, K2tog) in MC, (K6, K2tog) in CC, repeat from * to end. Next Row *P7 MC, P7 CC, repeat from * to end. Next Row (decrease row) - *(K5, K2tog) in MC, (K5, K2tog) in CC, repeat from * to end. Next Row *P6 MC, P6 CC, repeat from * to end. Next Row (decrease row) - *(K4, K2tog) in MC, (K4, K2tog) in CC, repeat from * to end. Next Row *P5 MC, P5 CC, repeat from * to end. Next Row (decrease row) - *(K3, K2tog) in MC, (K3, K2tog) in CC, repeat from * to end. Next Row *P4 MC, P4 CC, repeat from * to end. Next Row (decrease row) - *(K2, K2tog) in MC, (K2, K2tog) in CC, repeat from * to end. Next Row *P3 MC, P3 CC, repeat from * to end. Next Row (decrease row) - *(K1, K2tog) in MC, (K1, K2tog) in CC, repeat from * to end. Next Row *P2 MC, P2 CC, repeat from * to end. Next Row (decrease row) - *K2tog MC, K2tog CC, repeat from * to end. Draw yarn through remaining 7(9) stitches and tighten. Repeat side one, reversing the colour order. Still, however, cast on with Main Colour. Make a chain of 6 stitches, and join to make a ring. Make a short chain of three stitches out from the ring. This is a turning chain. Make 13 treble stitches into the centre of the ring. Join to the turning chain. This forms the inner round. Make another turning chain of 3 stitches out. Work your way around, making 3 treble stitches into the top 2 loops of each of the stitches in the previous round. This will create a ruffle. Once you have made your way right round the inner circle, join your yarn to the top of the second starting chain, and bind off. 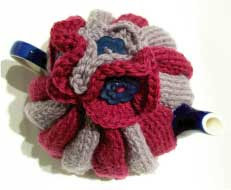 Add a button, and sew to the top of your tea cosy. 3 x 50gram skeins Rowan 4ply soft (2 main and 1 contrast), we used shade 400, suede, and shade 401, tea rose. 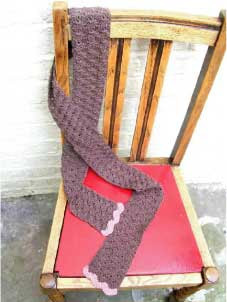 To make a symmetrical scarf, it is crocheted in two halves, and joined together in the centre. Row 2 – 1sc into 2nd ch from hook, *skip 2ch, 5tr into next ch, skip 2ch, 1sc into next ch; rep from * to end, turn. Row 3 – 3ch (count as 1tr), 2tr into first st, *skip 2tr, 1sc into next tr, skip 2tr, 5tr into next sc; rep from * ending last rep with 3dc into last sc, skip tch, turn. Row 4 – 1 ch, 1sc into first st, *skip 2tr, 5tr into next sc, skip 2tr, 1sc into next tr; rep from * ending last rep with 1sc into top of tch, turn. Repeat rows 3 & 4 until first half of scarf measures 84cm, ending with row 4. change to contrast colour, and repeat rows 3 & 4 one more time. Bind off. Repeat all for second half of scarf. Join the two halves together in the centre. Using 4mm needles, CO 64 (76, 88) sts. Row 3 – K1, *yfwd, K2tog, rpt from * until end of row. Continue in stockinet (K row, P row) until it measures 22 (25, 27) cm, end on WS row. Next row, K2tog throughout row, 32 (38, 44) sts. K1, P1, K1, P1, rpt until end row. P1, K1, P1, K1, rpt until end row. This forms moss stitch pattern. Continue until moss stitch section measures 6 (8, 10) cm. End on WS row. Continue in stockinet (K row, P row) until it measures 28 (32, 36) cm, end on WS row. P1, K1, P1, K1, rpt until end row. This forms moss stitch pattern. Continue until moss stitch section measures 8 (10, 12) cm. End on WS row. Continue to work these five stitches in moss stitch pattern, until strap measures 16 (19, 22) cm. CO remaining stitches. Repeat for second strap, using the 5 stitches on the stitch holder. Join the two straps to each end of the top edge of back moss stitch section. Join together front to back by sewing the side seams of the stockinet sections of vest, finishing where the moss stitch section begins. We are very sad that our lovely shop, Button & Skein, has recently become a victim of the recession and has closed its doors for good. 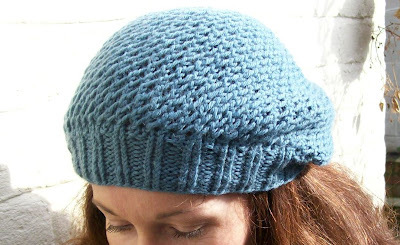 Rosa will, however, continue to knit, design and make her patterns available. 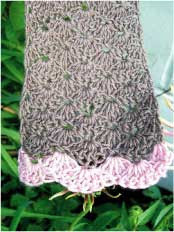 The first few patterns on this blog are those archived from Button & Skein.